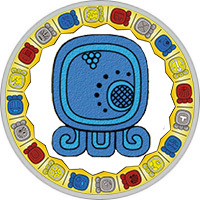 Mayan Name: KAWOQ / Cauac. Compatibility: Storm, Night, Deer, Monkey, Eagle. Sign of Storm (Cauac) — heavy rain, downpour with a thunderstorm. The meaning of the sign is a storm, a thundercloud, a thunder. The patron is the god of rain Chaak. The hieroglyph of the sign depicts a cluster of clouds in the form of a pyramid. Clouds bring rain — the source of life. The ancient Maya attached great importance to the rain, considered it a symbol of vitality. The pyramid is a symbol of the World Mountain, it is associated with the power of the earth. Thus, the Storm sign symbolizes the fullness of life energy, the explosion of feelings. According to the Mayan horoscope — people of the Storm sign are destined to live a difficult fate. They have an amazing ability to get into difficult situations. Representatives of this day — sensitive, vulnerable nature, too hard to tolerate adverse circumstances. Stressful situations take away a lot of strength from them, even the smallest problems make them suffer painfully. Try not to show their experiences, prefer to look bold people. For sharp judgments you can see the uncertainty, fear. At the same time, positive emotions spill out as violently as they carefully hide negative emotions. Constant struggle with their feelings tempers their character, the representatives of this sign look confident people, but a little sad, immersed in themselves. A career horoscope represents the person of the Storm sign as an ambitious worker seeking to occupy a high position. For sham calmness skillfully hides stubbornness and imperiousness. He always insists on his decision, it is almost impossible to convince him. But excessive sensitivity, a tendency to exaggerate problems are qualities that cause considerable inconvenience. Outwardly self-confident head or leading lawyer of the firm in the shower experience a storm of emotions, are very nervous. Much better people of the sign Storm feel, working in the creative field: an actor, a director, an artist. In this case, their natural emotionality is beneficial. In a romantic relationship, the people of the Storm sign are tyrants and despots. They demand complete submission from the elect, jealously follow his interests and hobbies. By horoscope of compatibility they are approached by calm, balanced people with a huge margin of patience. In life, any situation is possible, partners can swear and scandal. But the chosen one should not show aggression towards the person of the Storm sign, otherwise the tragedy of the universal scale can not be avoided. The reaction may be the most unexpected, a complete rupture of relations is possible. The man of the Storm sign is a contradictory nature. He dreams of fame and recognition, tries to build a successful career. But he suffers from fears and doubts, he feels a constant internal tension. In love relationships seeking peace and understanding, but often scandals, can not cope with their emotions. Able to feel and empathize a man can make an excellent pair of soft, pliable woman. In a happy marriage can get rid of fears and feelings, will find inner peace. Woman of Storm sign — a bright personality, affecting the minds of people around. A beautiful, fragile, gentle person excites the imagination of men. It seems that there is some mystery in it. With close acquaintance can manifest itself as an explosive, emotional person. According to the horoscope of compatibility, a strong man is suitable for her, able to solve all her problems: complicated relationships with colleagues, poor health, mood swings. With a worthy partner is ready to create a strong family, will not seek adventures on the side. The woman of this day is a loving and faithful spouse, a caring mother.